Very fresh green tea leaves. Pleasing fragrance. Smooth and robust taste. Highly recommended! great overall jasmine tea I have ordered this 3 times great as iced tea too!!! несколько лет покупаю этот чай на этом сайте и всегда отличное качество. For the price this is the best Jasmine. I got Jasmine from another tea place that was supposed to be very high grade, but I gave it away because I was so unhappy with it. This tea isn´t as good as Jasmine snow but it comes next in line. The best jasmine tea of this grade I have ever tasted. The scenting is lovely. The tea leaves are a deep moss-like green color, very fresh. Leaves steeped in a gaiwan can be re-infused multiple times all day long. The taste is sweet with very little bitterness. I appreciate the tea leaves freshness because it comes from this year´s harvest. Highly recommended! Nice tea with a very discret jasmin perfume,in conclusion a very pleasant tea for every day drinking. A good tea for every day use, with a balance flavor and with nice nutty flavor and not so smokie. For the inexpensive price, this jasmine tea is a great bargain. The tea leaves are fresh and are of good quality, very little bitterness. The fragrance persists. Multiple infusions are good to about five gaiwans. Overall, the brew is smooth and sweet. Bi Tan Piao Xue is a higher grade with a more vegetal and fuller taste, but this Sichuan jasmine, however, is pretty darn good and very drinkable. Highly recommended! Ароматный зеленый чай, мне особенно понравился с сахаром, не смотря на то, что некоторые виды зеленого чая с сахаром я пить не могу. В России такой чай не купить в каждом магазине. Рекомендую. Fragrant green tea, especially was pleasant to me with sugar, despite that with sugar I cannot drink some sorts of green tea. In Russia such tea not to buy in each shop. I recommend. Nice fragrant jasmine scented goodness. Fine leaves and pretty petals. Pretty good jasmine tea with flowers. Tastes fine. great flavor, I very much enjoyed this tea. will definitely be back for more. No special flavor ,it´s a normal jasmine tea that you can drink to cool out your thirst. I love this tea it has whole jasmine flowers that open up into a back drop of green tea leaves,a good traditional chinese tea. This tea comes close to being like Te Ji Pearl Jasmine tea. Another excellent choice if you like a Jasmine tea. One of my favorites! Great value for your money. Long lasting and fragrant tea for everyday use, good after meals. A good workhorse of a jasmine tea at an economical price. Its flavour lasts for several repeat brewings without disintegrating or becoming bitter. I recommend always to have a jar of this tea in your cupboard. 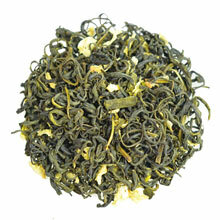 jasmine tea like you know it and like you get it in every shop. a surprise....not expensive and really good to drink. This tea comes close to being like Te Ji Pearl Jasmine tea. Another excellent choice if you like a Jasmine tea. Good relaxing tea. Nice aroma. Excellent dessert tea. Very sweet.